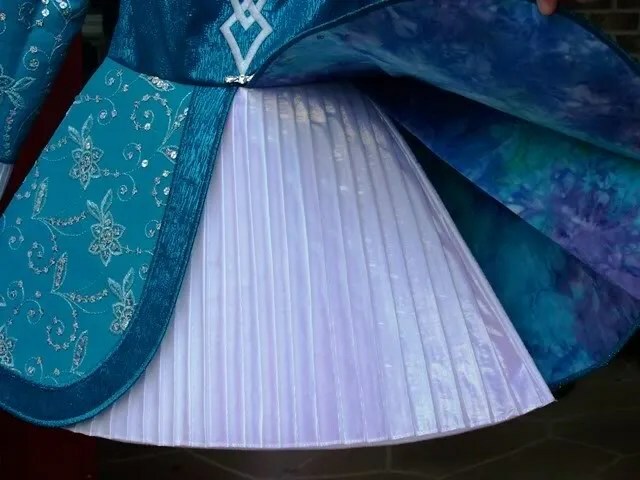 One of the things I have not liked about the swoop dresses I have seen and gotten to really inspect is the fact that the front skirt essentially functions as a single panel. They have kept the pleats between the front side panels (FSP) and the center front panel (CFP), but because of the shape of the FSPs, there can be no movement. Those pleats are useless and in some cases have been sewn completely shut. One dancer described her experience dancing in one as restrictive and even painful as she had to keep kicking against this sandwich board that did not move. 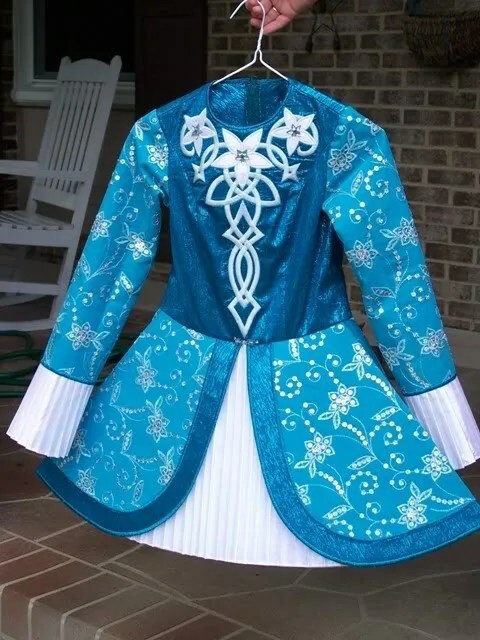 Some dressmakers have now come to the conclusion, rightly so, that since the pleats are useless, why not just make the front skirt a single panel from side to side? No pleats, no separate panels. But then there appears that problem of the side-to-side crease at hip level where the skirt has to bend when the dancer kicks. Susan and I kicked this swoop skirt issue around quite a bit. It’s what we do, talk things to death while we check out photos of dresses. Sometimes, with the phone on speaker, we just sit there and stare as we analyze everything and propose answers for some of the issues we see. We decided to try a swoop dress with a totally free center panel. This was the first one we attempted this on. First, I should clarify the size of this dress as it had bearing on the skirt hang. Many have told me they thought this dress was for a little girl, that it was a small dress. It is not. 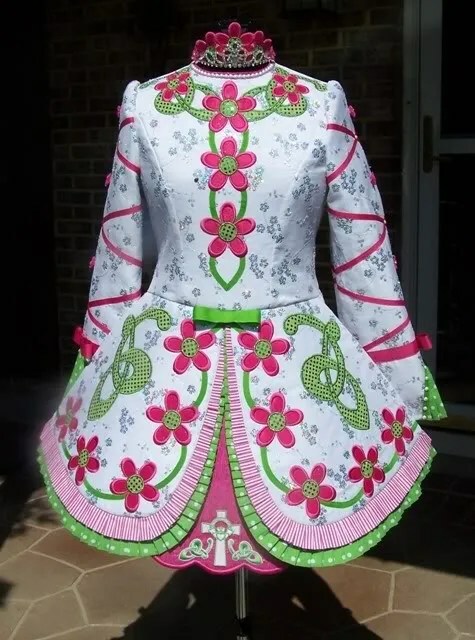 The young dancer is 16, and this skirt is 17 inches long. And, the dancer wanted the swoops to come pretty close together at the bottom to frame the cross. Considering how close in the swoops come, Susan and I both felt that the CFP did not need to be very wide, which I assumed would then make this very easy to dance in as not only would there be no pleats attaching the FSPs to the CFP, but the narrow width of the CFP would allow the dancer to move the FSPs more easily. Well, the swoops collapsed in and covered the cross. Granted, this skirt was fairly heavy because of its length and because of the 2 rows of pleated ruffles, but there was something else going on. Only option to fix this skirt was to sew the FSPs to the CFP. So much for this attempt at that idea. 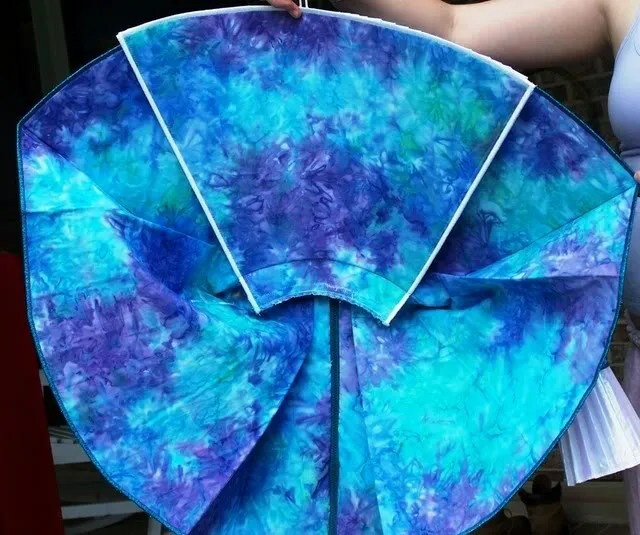 There are still pleats behind the FSPs (front side panels). In fact, we added to the depth of the side pleats to make up for no front pleats, therefore allowing kicking room. I still need to ask the dancer how it feels to dance in this skirt. So, Susan and I sat and analyzed the pics I took of that skirt before I sewed the panels down. It did not take Susan long…the tension in the skirt was all wrong, in fact, it was missing from very key areas. Susan’s design of the Feisdress skirt pattern in general is based on tension. She explained it to me in that scientific way she possesses, and off we went to the next dress. The front side panels are completely free, no collapsing, and the young dancer says dancing in it is very easy. So, what is different? The CFP is wider, and most importantly, wider at the top. This provides the necessary tension and support for the FSPs so they do not collapse. If you want instructions for this alteration of the Feisdress pattern, email Susan (susan@feisdress.com ). There have been a few questions on the boards lately about stiffeners and how many layers to use. I use FirmFlex that I get from shopper’s rule. Love this stuff. I only ever use 1 layer. Go here for my little treatise on using this stiffener.